(Nanowerk News) The leaves of the lotus flower have a remarkable property—they are self-cleaning. Because the leaves are hydrophobic, or water repellent, water that comes into contact with them forms spherical beads that roll along the leaf picking up dust and dirt on from its surface. Now, a research group from the Singapore Institute of Manufacturing Technology of A*STAR have developed a method that could eventually enable large surface areas to be coated with a hydrophobic layer that mimics this self-cleaning property ("Laser micro structuring on a Si substrate for improving surface hydrophobicity"). “Hydrophobic surfaces are desirable for many industrial applications such as anti-biofouling paints for boats, anti-sticking of snow for antennas and windows, self-cleaning windshields for automobiles, stain-resistant textiles and anti-soiling architectural coatings,” explains Xincai Wang from the group. Many techniques exist for making a surface hydrophobic. Coating a surface with chemicals that are naturally water repellent, for example, is one approach. However, this may not work for many surfaces. Moreover, such chemicals gradually degrade and are easily rubbed off, requiring continual retreatment. A more robust and longer-lasting approach is to change the microscopic structure of a surface. It is well known that structuring a surface to have micrometer-sized protrusions increases its water-repelling properties. But conventional techniques for patterning these structures, such as photolithography combined with reactive ion etching, are time-consuming and expensive. 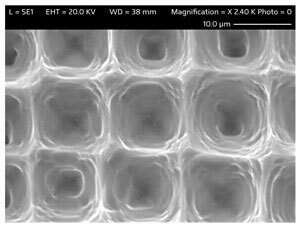 The technique developed by Wang and co-workers produces hydrophobic surfaces that are robust and potentially much cheaper than those produced by photolithgraphic patterning. First, the researchers drilled a dense array of pits into a flat silicon substrate with a sharply focused, ultraviolet laser (Fig. 1). They found that this step on its own increased the hydrophobicity of the surface, causing water droplets on its surface to form a more spherical shape than on an untreated surface. Such behavior is typically quantified by measuring the angle made by the base of a droplet with the surface, known as the wetting angle, which in this case increased from 64.2° to 97.5°. Next, Wang and co-workers used the silicon surface as a stamp to imprint the inverse of its pattern into the surface of a soft sol–gel film. Without modification, these films exhibited hydrophibicity with a contact angle of 110°. But imprinting them with the silicon stamp increased this to 138°. In future work, the researchers intend to extend this approach to make hydrophobic surfaces over large areas on an industrial scale.